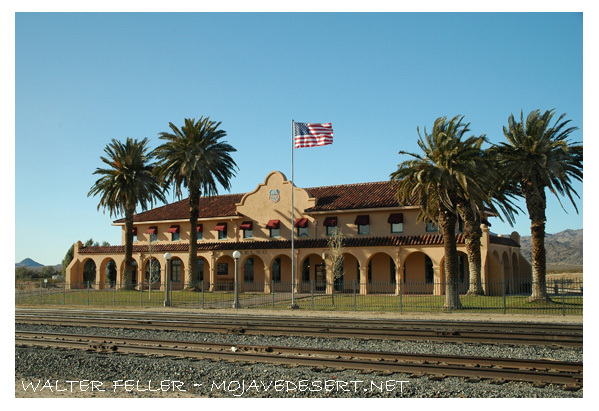 Kelso Depot seems like a quiet anomaly in the middle of the desert—but for the Union Pacific Railroad, it was a thriving necessity. Since its inception in 1862, the Union Pacific (UP) wanted a foothold on the west coast. After reaching Portland, Oregon, UP turned its attention to the rich California markets and the ports around Los Angeles. To get there, it needed to construct a railroad across the Mojave Desert. Kelso was crucial to reaching that goal. In August 1900, Utah Senator William A. Clark, a wealthy mine owner, bought a small railway in Los Angeles. With this purchase, he then started construction on what would become the San Pedro, Los Angeles & Salt Lake Railroad. In 1902, UP made a deal with Clark and purchased half the stock of the railroad before it was even completed. By the end of 1905, the track stretched from the west coast port of San Pedro to Salt Lake City, giving UP access to markets in southern California. Later, UP persuaded Senator Clark to sell his stock in the Salt Lake Route, giving UP full ownership of the line. The steep two percent grade from Kelso to Kessler Summit (later renamed Cima) meant that “helper engines” would need to be stationed nearby to assist locomotives up the 2,078 foot ascent. Additionally, steam locomotives of the era desperately needed water. Kelso had a reliable water source from a spring in the Providence Mountains, so it became the site of the “helper engine” station. The first depot at Kelso opened in 1905, followed a few months later by a post office, an engine house, and an “eating house” to serve railroad employees and passengers on trains without dining cars. Over time, the town grew as more workers were needed and their families moved to Kelso to join them. Railroad civil engineers in Los Angeles drew up plans in 1923, labeling the drawing “Kelso Club House & Restaurant.” For UP, a “Club House” was a company rooming and boarding house with recreational facilities (in later years the building was commonly called the Kelso Depot). The building would have a conductor’s room, telegraph office, baggage room, dormitory rooms for staff, boarding rooms for railroad crewmen, a billiard room, library, and locker room. Construction started in 1923 and the depot opened in 1924. Originally, the restaurant (sometimes called “The Beanery”) and telegraph office were operated around the clock. This continued through the boom years of the 1940s and ‘50s, when Kaiser’s Vulcan mine contributed to Kelso’s growth. In those years the population grew to nearly 2,000. When the mine closed, and diesel engines replaced steam, jobs and families moved away from Kelso. The depot function ended in 1962, although the restaurant and boarding rooms remained in use. In 1985, with a dwindling need for crew members to eat or stay overnight, UP decided to close the Kelso Depot. Believing that the now-empty Depot would become “a target for vandalism, unauthorized entrance, and a legal liability,” UP Division Superintendent G.R. Jenson made plans to raze the building. Local residents and others across the region heard about the proposed demolition and began to publicize the building’s plight. The group organized the Kelso Depot Fund and set about saving the building. After successfully halting demolition, however, they found the costs of restoration too expensive and turned to local politicians and the federal government for assistance. At that time, the Bureau of Land Management (BLM) already managed much of the land around Kelso as the East Mojave National Scenic Area—it made sense for the BLM to gain ownership of the Depot. Members of Congress from the area went to work and, by 1992, the BLM had the title to the building. With the passage of the California Desert Protection Act of 1994, the East Mojave National Scenic Area became Mojave National Preserve, and the Depot passed into the hands of the National Park Service. Renovation began in 2002. Kelso Depot reopened to the public as the primary visitor center for Mojave National Preserve in October 2005.